Electronic timer technology has changed the way homeowners interact with timer-enabled switches. Now consumers have the option of intuitive controls and settings that can be changed remotely, using smartphone apps. However, contractors are becoming more involved in the initial setup of these devices, which is a switch from what some installers may be used to. Fortunately, the latest generation of timers is making that process easier, as well, improving the experience for both contractors and their customers. Certainly, traditional analog/mechanical timers are still on the market. 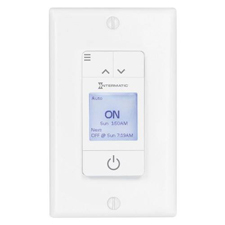 But today’s homeowners are increasingly looking for the kind of control options they’re becoming used to in lighting, thermostats, security cameras and other smart home-control products. As a result, manufacturers are also now working to make installation easier and more efficient. For example, some companies offer pre-programmed templates that can be selected to cover the vast majority of operations a customer would want to control. And, in some cases, contractors don’t have to wait for a Wi-Fi router to be installed and operational before completing their set-up work. Secure, peer-to-peer communication channels can allow contractors to perform set-up routines using proprietary smartphone and tablet apps without need for a Wi-Fi connection. This feature can be especially helpful in new-construction projects, by saving the need for a return visit after Wi-Fi networks are up and running.